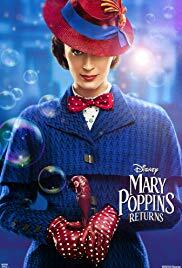 Mary Poppins Returns is the sequel to the 1964 classic Disney film. The movie starts with Michael Banks being unable to pay a loan and struggling to cope with life after the death of his wife a year ago. Mary Poppins arrives in an attempt to help the children and Michael save the house. Rob Marshall directs and the movie stars Emily Blunt and Lin Manuel Miranda. I love the classic version of the movie and was extremely excited for this. Unfortunately, Mary Poppins Returns is a bit of a disappointment. By no means is this movie bad, but it lacks the magic the original one has. When I first saw the original, it felt like I was transported to another world and it felt special. While some moments in this film do capture the magic, a lot of the movie either feels surprisingly bland or annoyingly stupid. One of the sequences that easily stood out to me was the animated one. The musical numbers were wonderful and the chase was well choreographed. I thought the song was catchy and Lin Manuel Miranda does a great job with the rap. But you already knew he would do great with that. His acting is also pretty great. He’s got this charm on screen and I would love to see him do more work. Most of the kids were also great. However, the real star of the show was Emily Blunt. Following Julie Andrews was never going to be an easy task but Blunt was near perfect as the character. At no point did she feel like she was trying to copy Andrews. Instead, she put her own twist on the Mary Poppins character and I loved it. Now I understand all the Oscar buzz and even though I don’t think she should win, she is definitely worthy of a nomination. Another Oscar nomination this movie is bound to get is for best original song. The Place Where Lost Things Go is an exceptional song and has so much meaning in the film. I got goosebumps while it was being performed. This song was easily the standout. Then again that isn’t saying much when you realise most songs are forgettable. Sure there are one or two others that were good but when a movie is a musical, you need more than two songs to be effective. I love several songs from the original and this pales in comparison. One of the absolute worst songs is the Meryl Streep one. She has a small role in the movie and is absolutely horrendous. I never thought I would say that. Nothing about her performance works at all. Her accent is one of the worst I’ve ever seen and her delivery is so off. A Meryl Streep cameo should have been one of the great moments but it falls completely flat. Furthermore, the final song feels stretched out and should have been executed in a better manner. Another issue I had with the film was the flow of the story. The editing felt very choppy and several scenes felt out of place and unnecessary. The biggest issue I have with the story, is one moment towards the very end that makes everything the movie does absolutely useless. It is one line of dialogue the movie could have done without and by adding it, the entire story felt pointless. Overall, Mary Poppins Returns has its moments and Emily Blunt shines. However, she can’t save the incoherent story and lack of magic and the movie was disappointing to me.